For the apricots, bring the sugar, water and wine to a boil in a wide-bottomed pan, without stirring, and reduce the heat. Simmer, occasionally agitating the pan, until a brown caramel is produced. Remove the pan from the hob, pour in the cream and simmer until reduced by half. Pit the apricots, quarter them and add them to the pan. Simmer on a low heat for approx. 5 mins., allow to cool slightly and share among glasses. For the Zabaglione, beat the sugar and egg white in a thin-sided bowl until the mixture is light in colour. Add the wine. Suspend the bowl over the gently bubbling bain-marie. Using the whisk attachment on a hand mixer, beat for approx. 5 mins., until the Zabaglione is frothy. 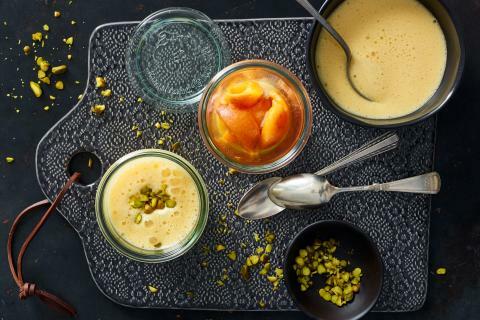 Arrange on top of the apricots, scatter with pistachios and serve immediately. Substitute peaches for the apricots.